Sosai Masutatsu Oyama was born on July 27th, 1923, in a village in Southern Korea. At the age of 9 whilst staying on his sister’s farm in Manchuria, he first learned the Martial Arts, studying the southern Chinese Kempo form known as “Eighteen Hands.” In 1938 Mas Oyama traveled to Japan with the desire to enter an aviation school and become a fighter pilot, but he was forced to abandon his dream and find work. He continued practicing judo and boxing and his interest in Martial Arts led him to the dojo of Gishin Funakoshi and thus, he started practicing Okinawa Karate. With his dedication, Mas Oyama progressed quickly and by the time he was 20 years old he had obtained his fourth Dan. It was at this time that Mas Oyama entered the Japanese Imperial Army and began studying judo in the hope of mastering its holding and grappling techniques. When he stopped training in judo, after about 4 years, he gained a fourth Dan. Following the defeat of Japan after the second world war, Oyama like all other young Japanese, was thrown into a personal crisis. He found a way out of his despair by training with So Nei Chu, a Korean Master of Goju-Ryu Karate. This great teacher, renowned for the power of his body, and deep spiritual inclination had a profound influence on young Mas Oyama. Master So taught him the inseparability of budo and the spiritual fundamentals of Buddhism. After a few years of training, Master So advised Mas Oyama to make a firm commitment to dedicate his life to the Martial Way and retreat to a mountain hideout and train his mind and body. In 1946, Mas Oyama went into training, at a remote spot, on the Mt. Kiyosumi in Chiba Prefecture. He was accompanied by one of his students named Yashiro and a friend Mr. Kayama brought them food supplies every month. Through vigorous training, Mas Oyama learnt to overcome the mental strain caused by solitude but Yashiro could not bear it and fled after 6 months. About fourteen months later Mr. Kayama told Mas Oyama that due to unforeseen circumstances he could no longer sponsor Mas Oyama’s retreat in the mountains and thus Mas Oyama’s original plan of remaining in solitude for three years was brought to an end. In 1950, Mas Oyama began his famous battles with bulls; partly to test his strength and also to make the world sit up and notice the power of his karate. All together, Oyama fought 52 bulls, killing 3 instantly and taking the horns of 49 with knife-hand blows. Mas Oyama opened his first “Dojo” in 1953 in Mejiro, Tokyo. This was the time that Mas Oyama’s karate strength was at its peak so the training was severe. Many students were members of other styles and Mas Oyama would compare styles and build on his karate. He would take what he felt were the best techniques and concepts from any Martial Art and gradually fit them into his training; therefore, laying the foundations of Kyokushin Karate. 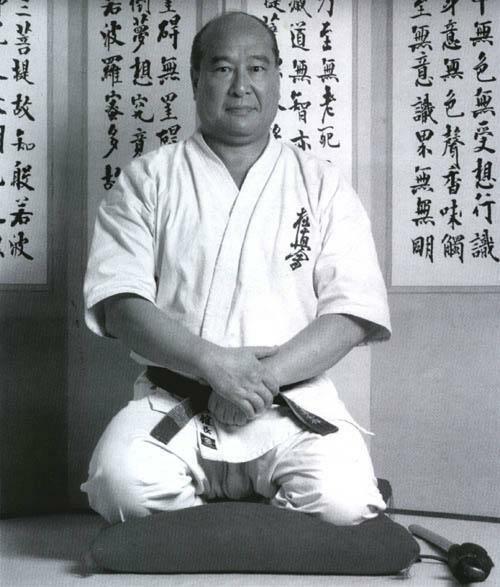 The first “School of Oyama” outside Japan was opened in 1957 by Shihan Bobby Lowe (Aug. 23, 1929 – Sep. 14, 2011) in Hawaii. In 1952, Mas Oyama gave his first demonstration in Hawaii. After the demonstration Shihan Bobby Lowe met Mas Oyama and arranged to train with him. Bobby Lowe’s father was an instructor of Kung Fu so he had done much training in the Chinese Martial Arts. He had participated in any fighting Art he could; by the time he was 23 he had earned his 4th Dan in judo, 2nd Dan in Kempo, shodan in Aikido but Mas Oyama’s powerful demonstration had stunned him. Mas Oyama invited Bobby Lowe to Tokyo to train with him and Bobby Lowe did and trained for over a year and a half. In this way Shihan Bobby Lowe became the first “uchi-deshi” of Kyokushin, a tradition that later grew to be known as the “Wakajishi” or Young Lions of Mas Oyama, where a select few are chosen each year to devote themselves to Karate for one thousand days. The building of the World Headquarters started in 1963 and was officially opened in 1964. It was at this time that Mas Oyama adopted the name Kyokushin “The Ultimate Truth”. Kyokushin had started its spread around the globe and at present is one of the largest martial art organization in the world. It goes without saying that a style is only as strong as the students who represent it. This is why it is the responsibility of all those who have chosen to follow Sosai, to train hard and forge and indomitable spirit so that the tradition of strength in Kyokushin Karate may be recognized by all for many years.